I recently experienced an extremely stressful life event. No, I didn’t get married or divorced. And no, I didn’t lose my job or have to cram for final exams. I moved. Those of you that have moved and haven’t completely blocked the horrible experience out of your mind can almost certainly feel my pain, and have now either sworn that you’ll pay ANY amount of money to have movers take care of everything next time (me), or that you’ll never EVER move again (wouldn’t that be nice). Despite all the stress and exhaustion though, the one thing I do love about moving is the fresh start it gives you, and having a new space to decorate and make your own. Lucky for me, my mom also loves this, so she was very excited to see my new place and start brainstorming fun things we could do with the blank canvas. The only problem is that my mom lives in Colorado and couldn’t see my place in person, so I needed a good way to share photos with her and be able bounce ideas back and forth. While I could have emailed the pictures to her (tedious) or posted them on Facebook (not the type of album I would like to have viewable by all my Facebook “friends”) I really just needed a quick and easy way to share a bunch of room-by-room shots of my new apartment. Enter Google+. From what I’ve seen, and all the different ways I’ve attempted to share photos with family and friends, Google+ is hands down the easiest way to share them with a select group of people. And the fact that Google+ has a beautifully redesigned mobile app doesn’t hurt either. Facebook is playing catch-up in this area and now implementing similar features, but at the moment Google+ does “selective sharing” the best. Most of us use our cell phones as our primary everyday camera, so the Google+ Mobile App is a really simple, organized way to share without oversharing. It also saves you from having to spend a ridiculous amount of time uploading each individual photo to email, which consequently fills your recipient’s inbox with huge files and more back and forth emails as you discuss each photo. 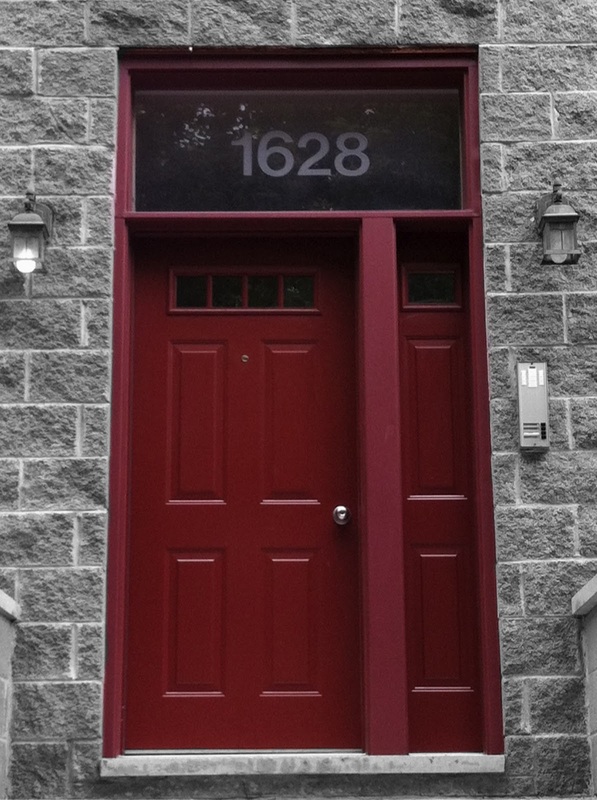 With Google+ I was able to share 20-25 photos of my new apartment with ONLY my Mom (who by the way does NOT qualify as a tech guru). Since she also has the Google+ Mobile App, she was able to access them directly from her phone and then able to comment and provide feedback all within the app. No one else could see any of these photos or comments, so it was essentially our own little private album. 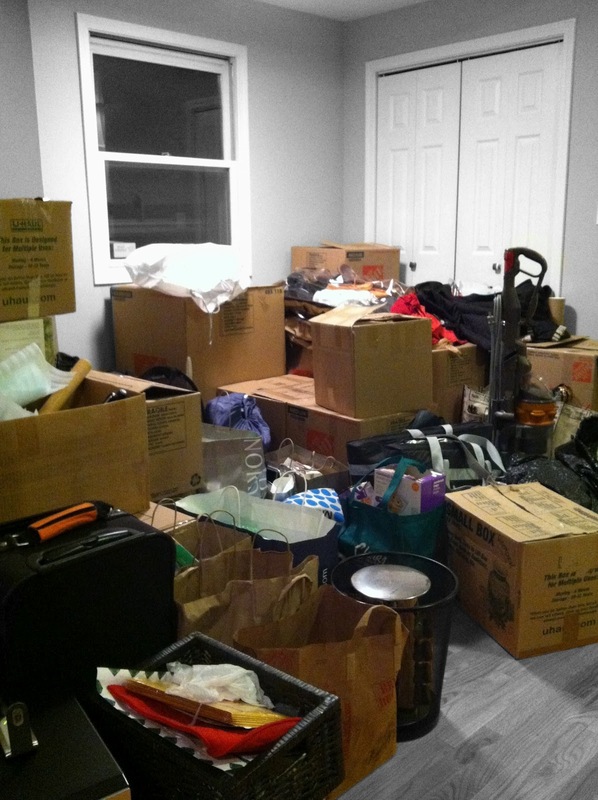 While my big move created an ideal scenario for this type of sharing, I have actually found myself using Google+ more and more for all types of photo sharing because most of the time I simply do not want to share my photos with everyone in my social network. Think back to the last dinner you had with your former roommates or another group of close friends. If you’re like me you might take pictures of the food, the restaurant decor and candid shots of your friends making goofy faces. Do you really want or need to share those photos with all of your Facebook friends? And more importantly, don’t you want to be able to comment freely and reference an inside joke or personal story that was mentioned without worrying that your Aunt or co-worker or former high school math teacher is silently judging you? If the answer is yes (and it should be) this is another common situation that is suited perfectly for Google+ sharing so you can post photos and comments without reservation. Another great thing about using the Google+ Mobile App to share photos is a feature within the app that allows for the “Instant Upload” (think back-up) of any picture you take on your phone, straight to Google+. Now I know this worries some people and can make you feel like you have no control over where your photos go – but the app does a great job here. 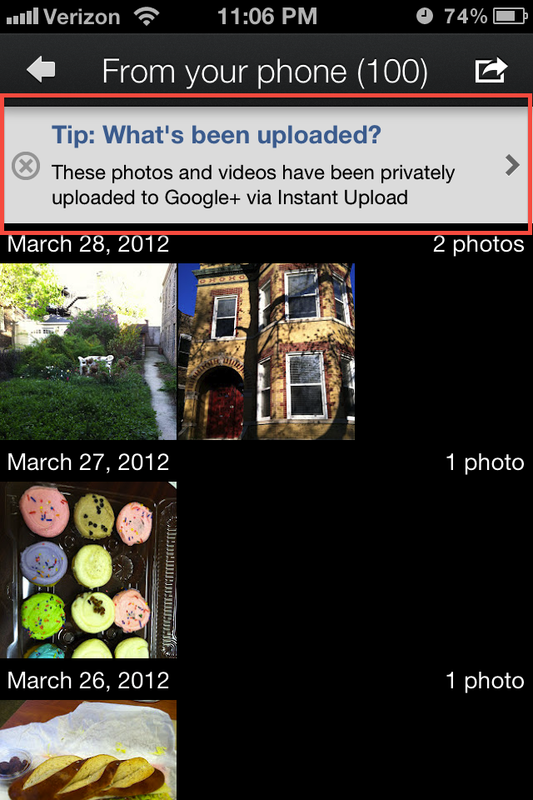 If you enable “Instant Upload,” any photo that you take from your phone will be automatically uploaded to Google+ and placed in a private album. 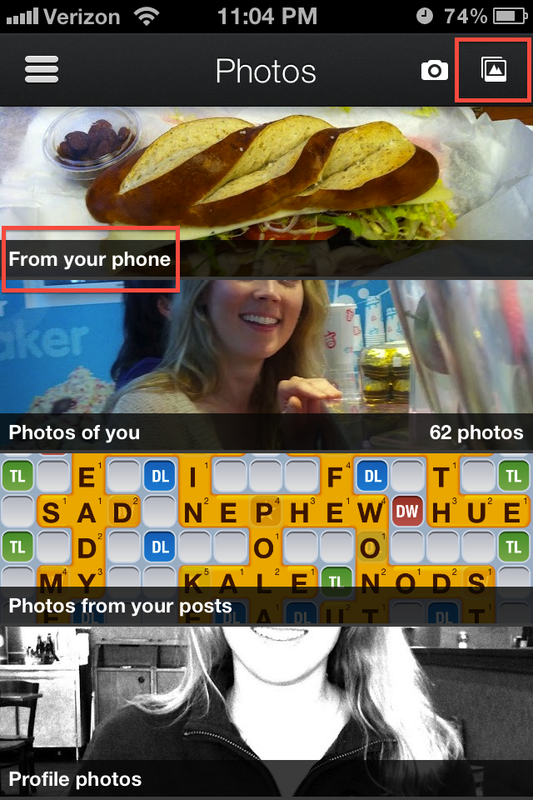 From there you can decide whether you want to share those photos and who you want to share them with. This came in handy when sharing 20+ photos with my Mom, because instead of having to manually select all of them from my iPhone photo folder they magically appeared in my Google+ “From Your Phone” album and were available to share immediately. Lose your phone (who hasn’t!)? Drop it in a toilet (been there!)? No problem – all of your photos are safely stored within the Google+ “cloud” and you can easily access them once you replace your device. If you use Facebook or email as your primary method of sharing photos right now, I’d recommend at least giving Google+ a shot. It makes uploading and sharing your photos completely painless, and ensures the only people with a view into your life’s moments are the people you’ve chosen. 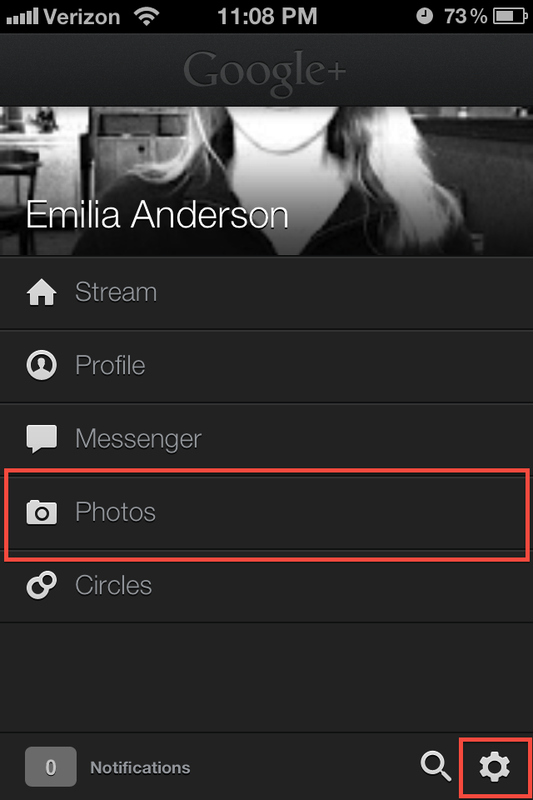 To upload pictures to Google+ from your computer, navigate to the “Photos” icon in the left-hand sidebar. From there you can access/share photos that have already been uploaded to Google+ or upload additional pictures from your computer. 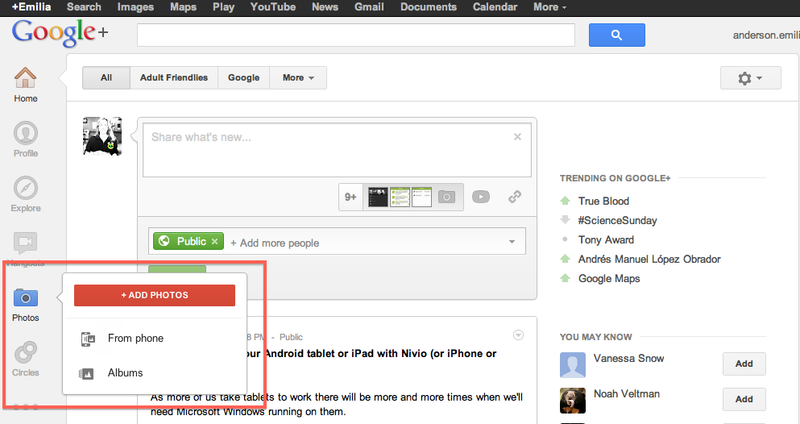 For additional help with Google+ and photo uploading and sharing, check out this Google Help Center page. From your iPhone or Android device, download the Google+ Mobile App via the App Store or Google Play. Navigating to the “Photos” section allows you to view all of the “Albums” that you’ve uploaded through either the mobile app or via Google+ on your computer. Note that the first album is called “From your Phone” – if you have “Instant Upload” enabled this is where those photos will be located.